It’s the new year and if eating healthy was one of your resolutions, you’re in luck. 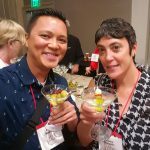 Last July I had the opportunity to attend my first International Food Bloggers Conference (IFBC) in Sacramento, California. One, it was a good excuse for a trip to California and two, it was offered at a ridiculously low entry fee for 3 full days of educational seminars, networking, and of course, lots of food…and wine. A low-cost entry fee plus 3 posts about my amazing experience…so to attend was a no brainer. The “Taste of Sacramento” was held one night. It was a foodie’s dream–all the best food and drink offerings from local vendors and conference sponsors. 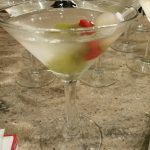 There was even a martini bar showcasing new Lindsay olives martini picks. 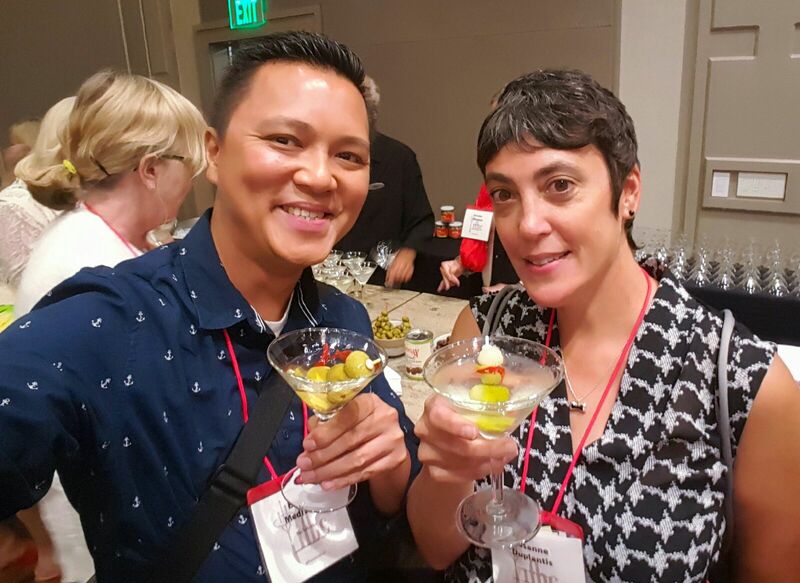 With martinis in hand, my new friend, Eli (aka Fine Wine Poet, if you are not following his blog you are missing out!) and I grazed our way through rows an rows of culinary delights. 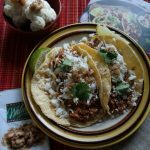 I then came across Roasted Walnut and Cauliflower Tacos from the California Walnut Board I was offered a taco, I turned it down. 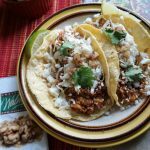 They looked good, but, come on, a taco with just cauliflower and walnuts couldn’t be any good. Could it? Then my bold martini self decided, yes, it sounds too strange not to try it. 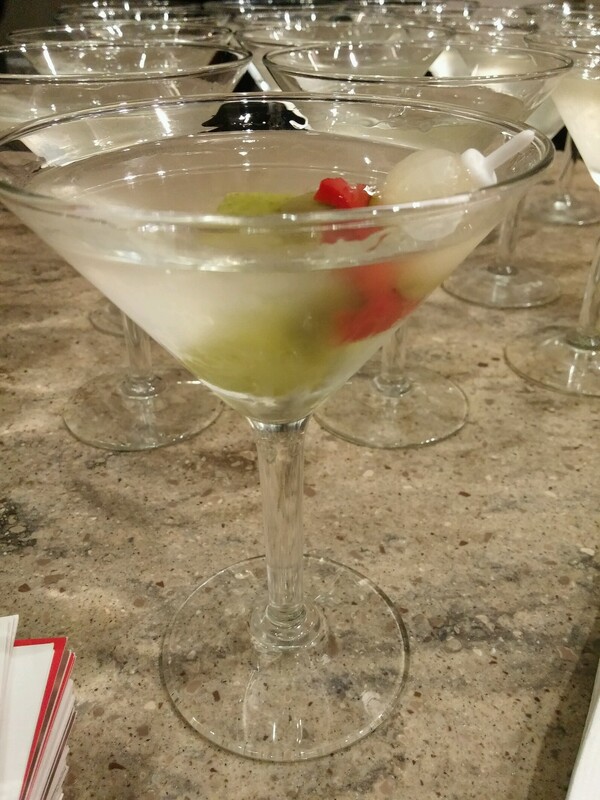 For once, I have my bold martini self to thank. They were the best tacos I ever tasted, and if you told me there was no meat in them, I wouldn’t have believed you. Preheat oven to 475*. Coat cauliflower with 1 tbsp olive oil; place on a baking sheet and roast for 25 to 30 minutes or until lightly browned. Reduce oven temperature to 350* and toast walnuts for 5 minutes or until lightly browned. Add to pan with cauliflower. Heat remaining olive oil in a large skillet over medium-high heat. Add onion and sauté for 5 minutes or until lightly browned. Add garlic and jalapeno and cook for 2 minutes more. Stir in water, tomato paste, chili powder, cumin, oregano and salt; cook until mixture is thick and excess water has evaporated. Stir in cauliflower mixture. 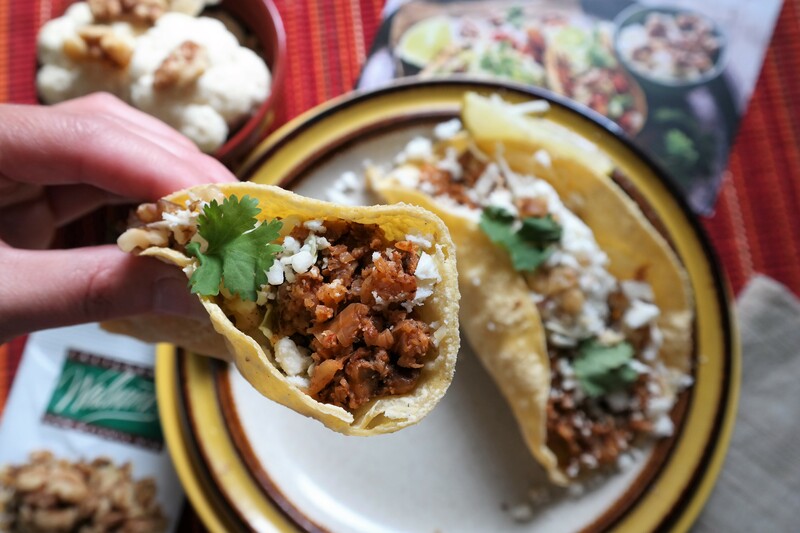 Spoon mixture into warmed tortillas and top with cabbage, cheese, walnuts and cilantro. Serve with lime wedges. Optional: Cauliflower mixture may be ground in a food processor so that it resembles the texture of ground meat. 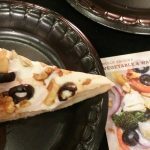 At the Taste, California walnuts also offered a pizza, yes, a pizza! 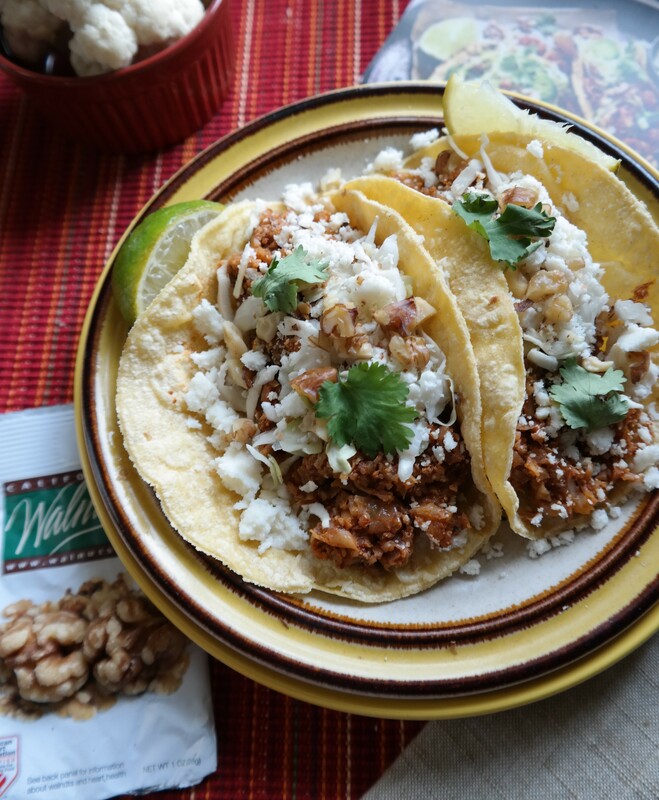 Aren’t you tempted to start cooking with walnuts? Head to the California Walnuts website for many more recipes that will have you saying, “Wow walnuts…who knew!” Bonus: Walnuts are heart healthy, too. Ready for a bite? Put Your TO COOK IS TO CREATE thinking cap on: This recipe is perfect. The only thing I altered was adding Queso Fresco (I had it on hand) for the Cojita. I’d recommend making a second batch, too. 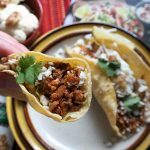 Use the low cost meat substitute filling for all your Mexican cravings-nachos, enchiladas, burritos. The leftovers make a very tasty stuffed pepper, too. Have any leftover grilled cauliflower? Use it. You’re one step ahead. Any leftover Cole slaw? Use it as a shortcut topping. Once you taste this meat substitute, I’m sure your mind will work like mine did thinking of all the different possibilities. FOOD FUN: Make this recipe and have your guests, family, or friends, guess the magical ingredients. If they’re not having any luck-time for a 20 questions game. Have kids or grandkids? 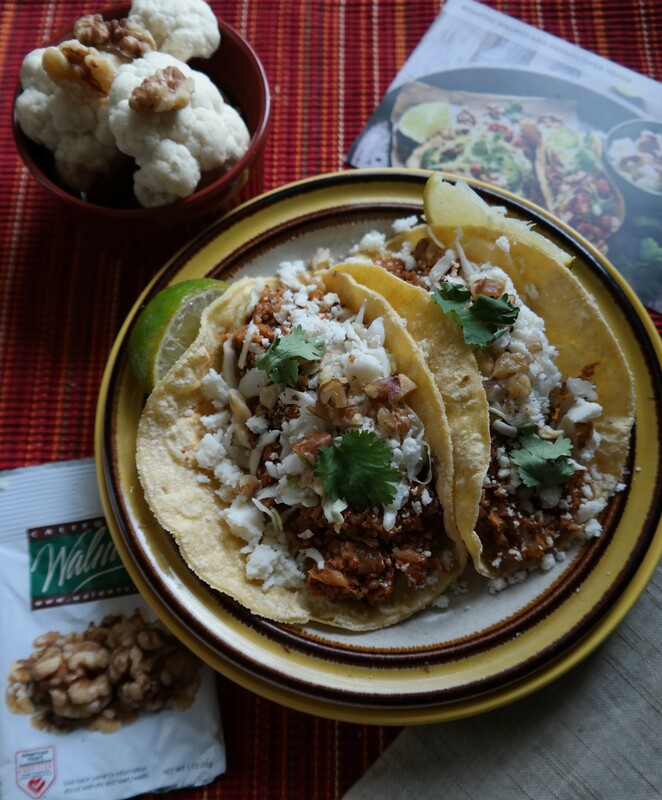 Top the tacos their favorite way and they’ll never know they are eating cauliflower or healthy walnuts. Great post once again, my friend! Happy New Year to you and yours. Maybe we can meet again at this years WFC! 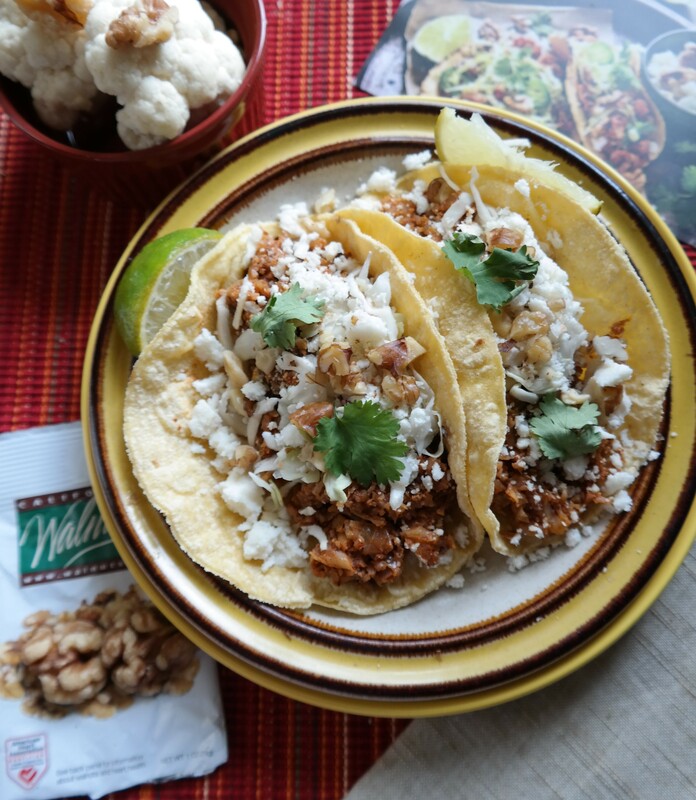 I’m going to try this cauliflower/walnut tacos this week. Catfish tacos are on the menu for dinner tonight!